Lakefront Vacation House with Fireplace and Hot Tub. 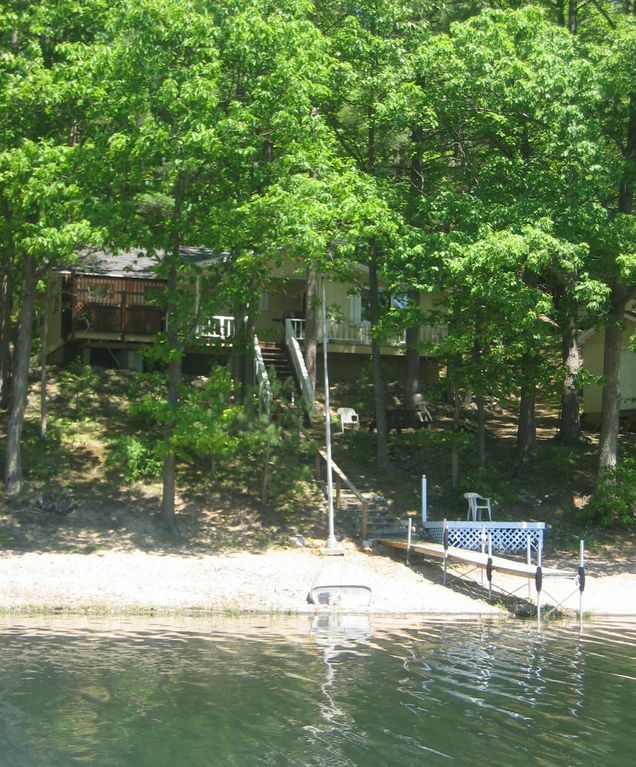 Enjoy a comfortable stay in this four season, lake front vacation home. This home has all the amenities of home on the inside, while being located on a beautiful scenic wooded lot with a deck overlooking 150 feet of shoreline on Lake Arrowhead. There is a 8 person Hot Tub located on the outside deck overlooking the lake which is a perfect retreat for spring, summer, fall or winter! Spring / Summer- Morel mushroom hunting, nature walks, biking, swimming, boating, fishing, hiking and golf. Gaylord is known as the 'Golf Mecca of the Midwest.' The area features over 20 world class courses. Most are less than 30 minutes away. Fall / Winter- Beautiful fall colors, downhill and cross county skiing and snowmobiling. Gaylord is centrally located inside Michigan's 'Snowbelt', receiving abundant snowfall each winter. Gaylord's trail system connects thousands of miles of marked and groomed trails. Family Activities-: Keeping the kids happy can make or break a vacation, but when visiting Otsego County, boredom is never a consideration. When the weather won't cooperate or the little ones have just plain run out of things to do, that's when it's time to venture out and discover the many attractions that can put smiles back on their faces. The Otsego County Sportsplex, where kids and grownups can swim in an Olympic-size pool or rent a pair of skates an take to the ice for 'wintertime' fun, even as the sidewalks are sizzling outside. Adjacent to the Sportsplex is the Energy Outlet, a quaint park filled with slides, swings and climbing equipment, all designed to delight and distract the kids from any thoughts of boredom. Throughout the park are structures embedded with information and etchings of the dinosaur age, and surrounding all the fun stuff is a paved walking track. and more family activities...: At Call of the Wild, fun and learning go hand in hand, and it's almost a sure thing that kids want to go back again and again. After touring the outdoors, vistors can step outside the museum to ride on a go-kart or play a round of miniature golf. Checking out the wildlife museum is great fun, but to catch a glimpse of the real thing, a stop at the elk-viewing area at the end of Grandview Boulevard (just east across South Otsego Ave. from Wiscousin St) will afford you a close-up view of North Michigan wildlife. If you still have energy after all that, give some through to seeing a movie at Gaylord Cinema on M-32 West, which shows several different features daily. Mitch was very prompt and accommodating when we needed. Appreciate the quickness of response and convenience. We will consider staying here again. Such a cozy cabin to enjoy a winter weekend get away. The cabin was clean and cozy and fit our needs perfectly. The steps were a bit slippery during our winter stay, but everybody was able to manage them without incident. It would be fun to stay in the summer sometime! The inside of the cabin was very nice and felt like home. The deck and Jacuzzi were absolutely wonderful (one of the nicest Jacuzzis I've ever been in. We really enjoyed our stay. The one thing that I think should be made clearer at the time of booking is the stairs, and steep inclined hill that you have to haul everything down to the cabin. It's no big deal for healthy young people, however anyone who is unsteady on their feet could not make it down to the cabin. We had to unload our cooler into grocery bags and carry the stuff down a little at a time. We left everything that we didn't absolutely need in the car. Having said that, this was the nicest rental cabin we've ever had. Nicely located to Gaylord and other points of interest of the northern Lower Peninsula. Hot tub was private and perfect for relaxing and enjoying the mild weather. Very clean and quiet, the lake is crystal clear. We loved the hot tub. We had a few small issues and contacted the Maintenance man Dan and he was right on it. Very good communication! We really enjoyed our stay, Got a work out on the steps though. Thank you Mitch! We loved our week at the 'Beige Cottage' on Lake Arrowhead. The stairs to the cottage and then to the lake were challenging for our mid-sixties knees, but the view of the lake from the porch was magnificent and well worth it! Beds very comfortable and ceiling fans made sleeping better than home. We had difficulty starting the gas fireplace one chilly day...and Dan was at the house in less than 30 minutes to check it. The hot tub was very clean and chemicals checked twice during our stay--we used it every night with the exception of the one night we had a tornado touch down just north of us. We used the three kayaks and enjoyed the scenery around the entire lake. We had a pair of Blue Heron we would see most mornings. Told of a pair of eagles nearby but didn't see them. Convenient to restaurants and shopping in Gaylord. Definitely recommend this cottage for peaceful getaway. Lake Arrowhead: An all-sports lake suited for every type of water activity (water level differs from year to year) including boating, personal watercraft, water skiing, swimming, and fishing (walleye, bass, blue gill, perch, pike). A canoe and paddle boat is at the cabin for your use and a Pontoon Boat is available to rent (first come, first serve). Golf: Gaylord is known as the 'Golf Mecca of the Midwest.' The area features over 20 world class courses. Most are less than 30 minutes away. Ski: Gaylord is centrally located inside Michigan's 'Snowbelt', receiving abundant snowfall each winter. Enjoy both downhill and cross country routes. All major ski resorts (Boyne, Crystal, etc.) are only a 30 - 45 minute drive from Lake Arrowhead.